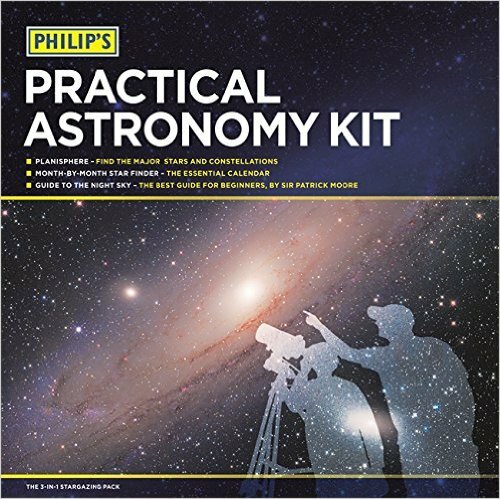 And the Phillips Practical Astronomy Kit, this usually sells for upwards of £25, you can order it here with SpaceKidets for just £45 inc postage. Please hurry though, once they are gone they are gone! Philip’s 51.5N Planisphere: A practical hour-by-hour tracker of the stars and constellations, designed for use anywhere in the British Isles, Northern Europe, Northern USA and Canada. Turn the oval panel to the required date and time to reveal the whole sky visible from your location. The map shows stars down to magnitude 5, plus several deep-sky objects, such as the Pleiades, the Andromeda Galaxy (M31) and the Orion Nebula (M42). Philip’s Month-by-Month Star Finder (64pp): Star charts show the position of stars, constellations and other celestial objects for each month of the year, in both northerly and southerly directions, for observers in the northern hemisphere. The introduction explains the basic facts that observers need to know: the apparent motions of the stars, seasonal changes, star brightnesses, the nature of the Milky Way, and how the night sky is represented on maps. In addition, location tables are provided for the four planets bright enough to be seen easily from the Earth with the naked eye: Venus, Mars, Jupiter and Saturn. The principal lunar features are also indicated on a pair of photographs showing the Moon at first quarter and at last quarter. Philip’s Guide to the Night Sky (48pp): Find your way around the night sky with this handy guide to stargazing for the complete novice, suitable for all ages. Sir Patrick Moore explains how to find the most famous constellations and the brightest stars, and when to look for them. Clear star maps, showing stars visible to the naked eye, help you to navigate the skies. The maps are suitable for use in Britain, Ireland, northern Europe and Canada.